Starting with a trickle in July, the stores tease us with what is ahead for the fall. By now, we are inundated with fall fashion in deep rich colors and cozy styles. Boyfriend cardigans, open front wraps and the most prominent trend this season, the cape poncho. 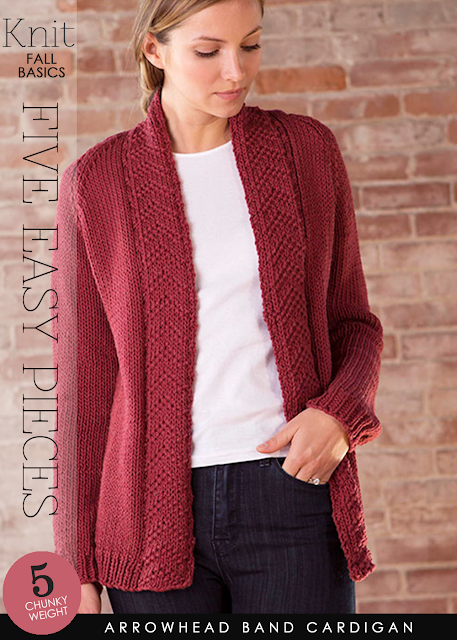 Throughout the fall, I will feature posts with 5 easy pieces, key wardrobe pieces including cardigans, pullovers and ponchos. Cardigans to me are the main component of the wardrobe. They have taken over from the structured jacket in a lot of women's minds. Not only do these pieces add color and finish to a look, they can create a soft, flattering shape. Styling with a cardigan can be casual with jeans and yet rise to a more dressy occasion just by adjusting such accessories as scarves and jewelry. From classic worsted yarn weights to super bulky outdoor wear, there are five easy pieces to consider for your fall wardrobe.